Prep the dry noodles according to package instructions. Set aside. Whisk together sauce ingredients in a small bowl. Set aside. Heat a small amount of oil in a wok. Stir fry the garlic and chiles until fragrant. Add the shrimp, gai lan and sauce and stir fry, until it is nearly fully cooked. Add the noodles. Stir fry until the shrimp is fully cooked then stir in the basil. Serve immediately. Drunken noodles are a Thai restuarant staple. The origins of the name is somewhat cloaked in mystery but the most popular seems to be that these noodles are so spicy that you'll want to drink a lot. I've also heard that they are a good dish after you've had too much to drink. Frankly, I don't think you need an excuse to eat these noodles. 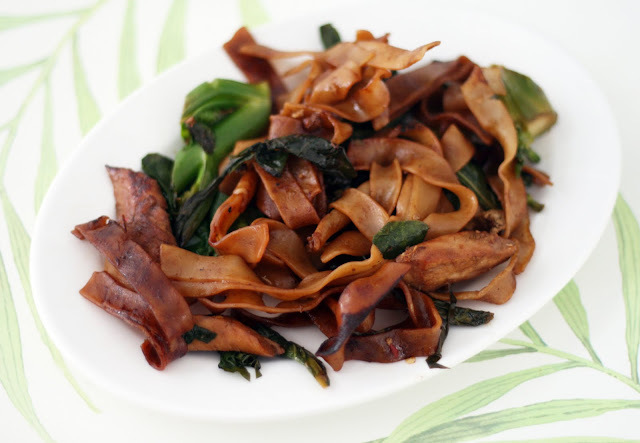 My favorite version, which I reproduced here, has gai lan (Chinese broccoli) in it to make it more of a full meal; some versions are basically just sauce, protein and noodles. 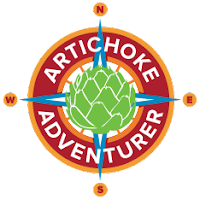 The trick to drunken noodles is using the correct sauce and if you can find it, holy basil or at least Thai basil. 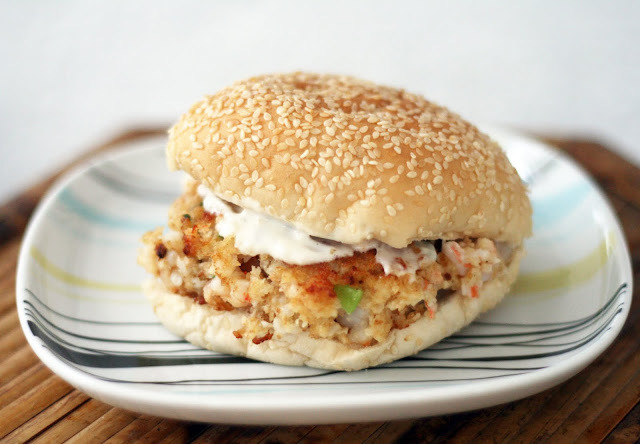 You can swap out the shrimp with an equal amount of chicken, pork or tofu. Ground meats work well too. Cut the bottom crust off the bread. Place the water chestnuts in a food processor. Pulse until coarsely chopped. Add the spices, shrimp, sesame oil and egg white. Pulse until it forms a chunky paste. Transfer to a bowl. Stir in green onion. Spread each piece of bread with the shrimp mixture. Sprinkle with sesame seeds. Cut into 2 or 4 triangles or leave whole. 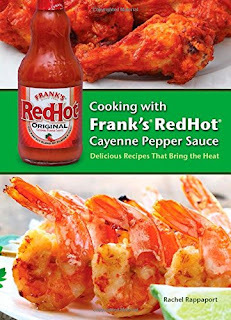 Heat 1/4 inch oil in a skillet or wok to to 350. Fry the triangles shrimp side down until pink and golden, about 1-2 minutes. Flip and fry the other side until golden, 1-2 minutes. Drain on paper towel lined plates. Eat immediately or keep warm for up to 30 minutes in an unpreheated 200 oven. When I was child, we would only on the rarest of occasions get takeout of any kind and Chinese was always my favorite. The place closest to us was one that my mom had been going to since she was a teenager and had good entrees but great egg rolls and shrimp toast. The shrimp toast was a whole smallish slice of bread with minced shrimp spread on top and then deep fried. It was seldom greasy and as an occasional treat, quite exciting. I live too far from that place to get takeout from there now so whenever I feel nostalgic, I try an order from whatever joint we're trying out at the time (if only we could find a place we like with consistent food!). 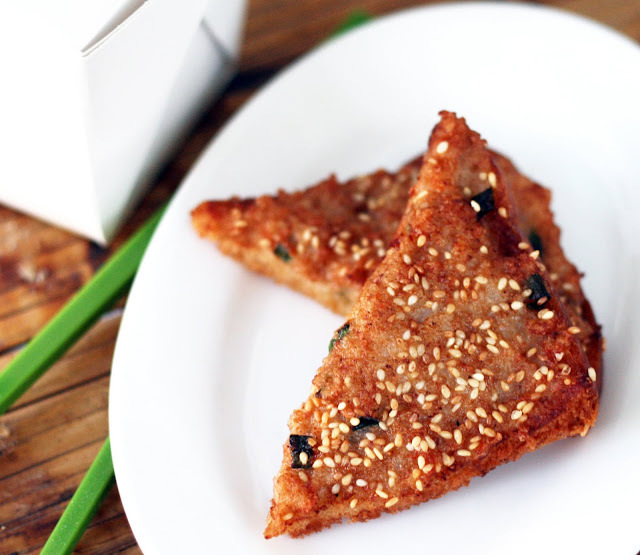 There is one place fairly close by that makes a good, chunky shrimp toast cut into small triangles and dotted with sesame seeds. I hadn't had it with sesame seeds before but quick googling told me that this is apparently a common way to make it in UK. For all I know, it is common in the US as well, but I've only encountered it at this one place. Anyway, as I am wont to do, I got to thinking about making shrimp toast at home so the next time we got takeout, I got an order to see if I could figure out what went into it. While I really hate the texture of water chestnuts, the slight crunch I'd encounter in an occasional bite made them think they might be present as, perhaps unsung, secret ingredient in shrimp toast. I thought I detected some shaoxing and ginger but beyond that, I was uncertain. I still wasn't sure how the mixture stayed together but when I saw shrimp for a great price, I bought some, picked up some water chestnuts and thought I would just wing it. As it turns out, all you really need are some shrimp, water chestnuts, a bit of flavoring (shaoxing, a touch of ginger), a quick pulse in the food processor and you have a shrimp paste that is thick and sturdy enough that it would stick to the bread and not flake off into the oil when it was fried. I had thought I'd have to add something to make it all stick together but apparently not. I was glad I didn't have to add more egg or cornstarch than I did, I didn't want it to taste eggy or powdery. Since I was making it at home, there was no need to deep fry, a shallow pan of oil is well enough. I made a couple whole slices, a couple cut into 2 triangles and some in 4 triangles and like the 2 triangles the best. A satisfying amount and a good ration of insides to crispy edges. I added the sesame seeds mostly so it was more interesting looking than a flat, brown triangle but it did add a pleasant note of sesame I think went well with the other flavors. So, impress your friends and make shrimp toast at home. 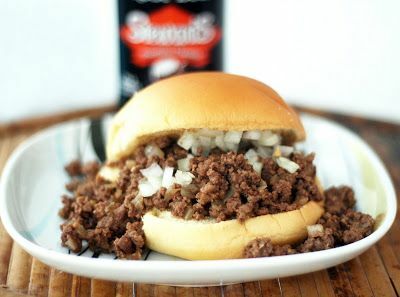 It is surprisingly easy and delicious. Note: Leftovers are best stored in an air tight container in the refrigerator. The next day they reheat pretty well on a paper towel lined baking sheet @ 350 for about 8 minutes. Also, if you happen to have some shrimp paste leftover (you shouldn't but bread slice sizes vary) I bet it would make a great dumpling filling. Presuming you have or want to make dumpling wrappers. For the barbecue sauce: Pulse all ingredients in a blender until smooth. Pour into a small saucepan and simmer on the lowest setting until heated through. Allow to cool. For the pizza: Place the chicken in a resealable bag with about 1/4 cup of the sauce. Refrigerate for 15-30 minutes. Heat oil in a skillet. Saute the chicken until just cooked through. Mix the two cheeses together in a small bowl. Spread about 1/4 cup of sauce on each pizza. Top with the cheeses then onion and chicken. Follow the pizza directions for baking. Sprinkle with cilantro prior to serving if desired. When I was in college I loved this barbecue chicken pita this one locally owned restaurant served. It had a not too sweet sauce, red onions, Gouda and a sprinkle of cilantro in a homemade pita. I must have eaten that at least once a month (and often more) for a year or two. The place also sold a lot unusual pizzas (and oddly, Egyptian food) and had a similar pizza version on the menu but I didn't like it as much as the sandwich. I think their ratios were slightly off. I stopped ordering the sandwich after a there was some staff turnover and it just wasn't as good any more. But I've sort of missed it. I was going to try and recreate the sandwich (but better!) but I thought I'd try to make the pizza instead. That really stuck out as something I thought would be amazing but was kind of sub-par. I knew I could do a better job! I started with homemade barbecue sauce that was slightly thicker than what I might want to use on say, ribs, as both a sauce and marinade for the chicken. I also used smoked Gouda instead of regular for extra depth of flavor. Gouda isn't the meltyest cheese so I mixed with with a bit of mozzarella to ensure maximum pizza coverage. 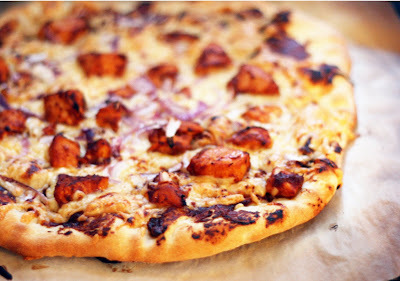 The perfect barbecue chicken pizza. Toss the celery and lobster, together in a medium bowl. In a small bowl, whisk mayo, vinegar, lemon juice, salt and pepper. Pour over the lobster and celery and stir until the lobster is lightly coated. Refrigerate 20-30 minutes. Melt a bit of butter in a skillet and lightly toast the rolls on either side. Generously fill with lobster. Unfortunately our trips this year do not include a visit to the lobster roll epicenter, Maine. But that doesn't mean I can't enjoy a lobster roll. We bought a couple of lobsters (and since the store offered, let them steam them since we knew we'd be eating them cold anyway) and I tried to get as much meat out of them as possible, my years of crab practice really paid off. Lobsters are so much easier! I was sort of tempted to buy the (cheaper) lobster tail but I am glad I went for the whole lobster, the meat was juicy and claw meat was super sweet. A welcome addition to the mix. 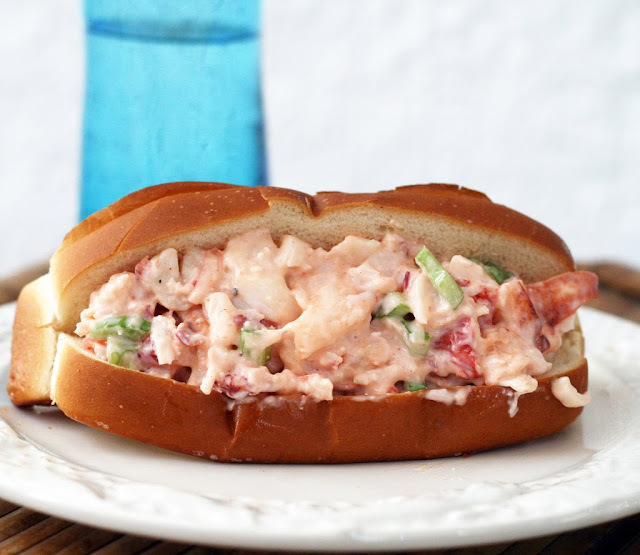 The trick to the lobster roll is not overwhelming the lobster. I wanted to add some zip so I decided on using the subtle tarragon vinegar and a splash of lemon juice to thin out the mayo without being overpowering. I was excited to find the "New England style rolls" at Wegmans last week, while technically you could use hot dog rolls, these rolls were perfect. 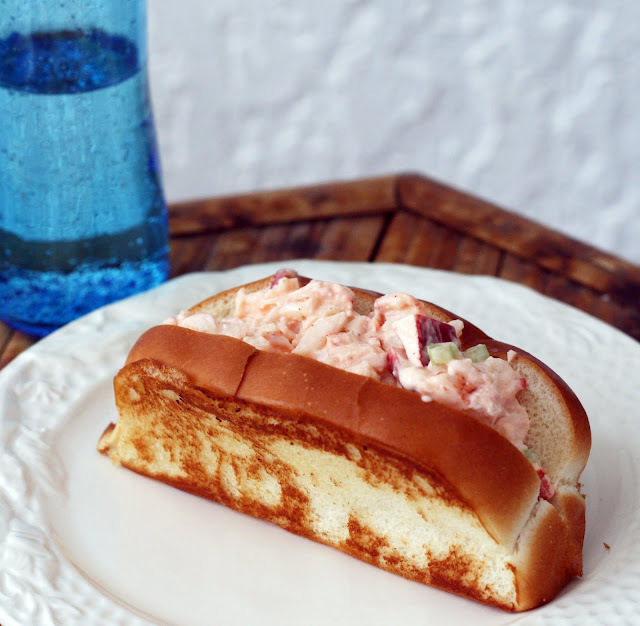 The sides toasted up wonderfully and they weren't as deeply split as hot dog rolls are so they really support the lobster. I hate when you bite into a sandwich and the filling falls out. Not a problem with these lobster rolls. They are crisp and slightly buttery and warm and super lobster-y. The perfect sandwich to ease you into spring. Note: Since lobsters are pretty pricey I decided to stretch them even further by making lobster stock. I added the shells, any juices I could save, a sliced lemon, 2 onions (cut up), 3 carrots, a bunch of limp celery, parsley stems and a couple of shallots (cut up) to a big (lobster) pot of water and cooked it until a bunch evaporated. Then I divided up in 2 and 4 cup portions and froze it for future use. It will be great in risotto or any sort of seafood dish. Place the chicken and marinade ingredients in a resealable bag. Refrigerate for 30 minutes. Meanwhile, whisk together the sauce ingredients. Set aside. Steam the broccoli until just crisp. Heat some oil in a wok. Add the chicken and cook until nearly cooked through. Add the sauce, mushrooms and broccoli. Bring to a boil. Stir in the cornstarch and cook until it thickens, just a minute or two. Serve over rice. 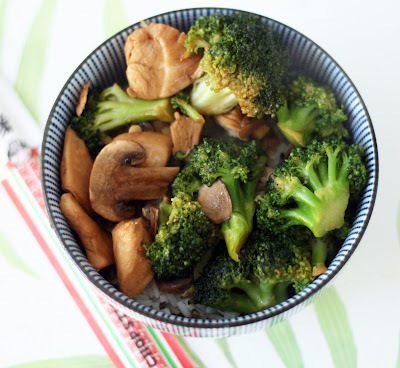 While chicken & broccoli is a pretty popular Chinese takeout choice, I really wasn't too interested in (it seemed too plain) but once a friend ordered it and had them add mushrooms that I tried it and got slightly hooked. I haven't had it in years but when I found myself in possession of chicken, broccoli and a bunch of button mushrooms on the verge of spoiling I thought I'd try my hand at making it myself. 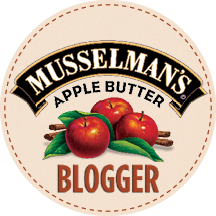 It was super easy and so much lighter and fresher tasting than I remember. I personally like it a lot more with the mushrooms than without but the mycophobic could leave them out and it would be just fine. You could also sub in an equal amount of firm or fried tofu, beef or pork for the chicken. Whisk together the sauce ingredients. Heat in a small pan, whisking until the cornstarch has dissolved. Set aside. Quickly saute the vegetables, ginger, garlic, shrimp and pork until the cabbage is just starting to wilt. Remove from heat. Add sauces and toss to evenly distribute. Allow to cool slightly. Heat canola oil to 350. Place a small amount of filling (about 1/4 cup) in the center of the egg roll in sort of a log shape on each wrapper. Place the wrapper so it like a diamond in front of you then fold each side towards the middle and roll towards the top. Seal each seam with the egg wash. Paint the seams again with egg wash. If you find that your egg rolls leak, try using less filling, the size of egg roll wrappers vary slightly by brand. Fry until golden, flipping occasionally, drain on paper towel lined plates. *Not spring roll wrappers, not lumpia wrappers or rice paper wrappers. Look for them in the refrigerated section (normally near tofu or fresh noodles) or in the freezer section of a well stocked supermarket or Asian market. Try to find an Asian brand for best results. One of my favorite food related books is about Chinese food and more specifically, American Chinese food. It is a great look into the difference between traditional Chinese food and the evolution of Chinese food in the country. It doesn't have any recipes but every time I pick it up, I am once again inspired to make some homemade versions of takeout. I mean, I love takeout Chinese food but we just don't have a consistently good place to get it. One place will have good won ton soup but the dumplings are bad. Another place has great appetizers and soups but their entrees are uniformly greasy. It has become easier just to make my favorites at home. A good egg roll is a thing of beauty. A bad egg roll is a soggy, oily, bland mess. Luckily it isn't terribly difficult to make egg rolls at home. Even the frying adverse can handle it, they float and do not need to be deep fried. Plus you get to put whatever you want in it! I like shrimp and pork and lots of cabbage in mine and of course, I prefer the slightly chewy skin of an egg roll verses the splintery crisper wrapper of the spring rolls some restaurants try to pass off as egg rolls. They really aren't difficult to make at all, it just involves a lot of chopping. I actually like make them the same day I make lo mein because they use a lot of the same ingredients which makes the prep for both go easier. 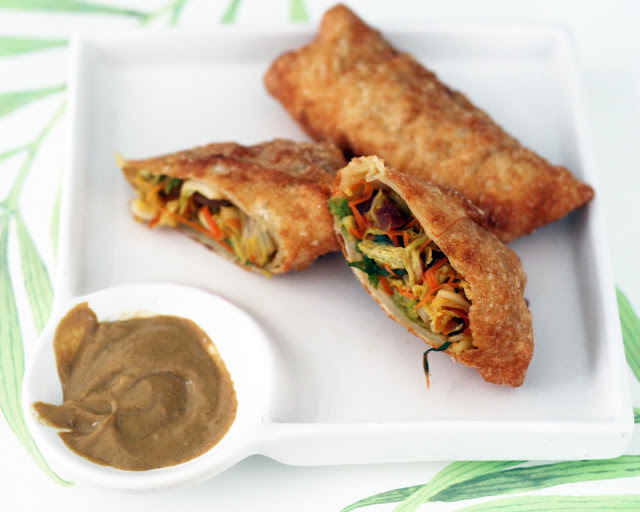 These egg rolls have a lot of flavor from the various flavors and well, people are always impressed when you make something as ubiquitous in the takeout world as egg rolls at home. The fact that they are more flavorful and fresher tasting than their carry out compatriots is almost icing on the cake. Now, I hear egg rolls freeze well and I froze one to give to friend to test this theory out but even living in a two person household we can easily blow through the whole batch in a couple of days. If you do want to freeze them, place them (fully cooked)in a air tight container in the freezer. Then when ready to eat place them (frozen) in the oven on a paper towel lined pan at 325 until heated through. Cook noodles according to package directions. In a small bowl, mix together all of the sauce ingredients, set aside. In another small bowl, mix together all of the omelet ingredients. Pour into a small hot nonstick skillet or crepe pan. Allow to cook through in a single layer to form a sort of egg pancake. Remove to a plate and slice. Meanwhile, heat the oil in a large skillet or wok. Add the pork, ginger and garlic and stir-fry until the pork is just about heated through then push meat to the side and add all of the vegetables and the omelet. Stir-fry until the pork and vegetables are warmed through. Add the sauce and cook 1 minute. Toss with the noodles, garnish with green onion. Serve hot. *We followed this recipe with the addition of a bit of red fermented bean curd mashed into the marinade. To make dinner a little quicker, we marinated the pork overnight on a Thursday, roasted it on Friday then refrigerated it overnight and used it to make lo mein on Saturday. This made the meal come together very quickly, there was no "downtime" on Saturday while the pork was roasting. The pork does not have to be hot when you add it to the wok. I don't think I have ever been in a American Chinese takeout joint where at least one customer wasn't eating or ordering lo mein. And why wouldn't they? You can't get more comforting or familiar than a heaping mound of noodles, vegetables and meat. 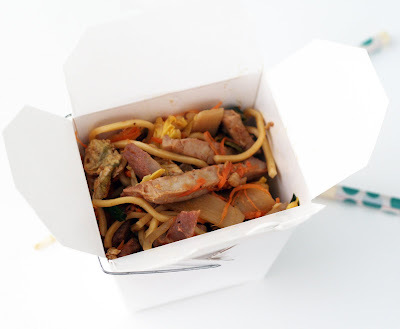 Unfortunately, the lo mein found in most restaurants is a either a. very salty, b. very greasy, c. lacking many vegetables or d. all of the above. Luckily, lo mein is one of the easiest things to make at home. The most difficult thing to part is finding the fresh lo mein noodles but just about any Asian (we have the most luck at the Chinese and Korean stores) grocery or even a very well stocked "regular" supermarket will have them in the refrigerated section. Dried lo mein noodles are an acceptable substitution but the texture won't be quite the same and frankly, I don't find them any easier to find than the fresh variety. Anyway, making lo mein at home is a revelation if you've only had the takeout variety, it is fresh tasting and while the sauce tastes pretty much the same, it is grease-free. Heat the olive oil and butter in large skillet or saucepan. Add the onions. It is okay if they are mounded high in the pan, they will cook down quickly. Cover and cook the onions until just beginning to soften, stirring occasionally so they cook evenly. Stir in the balsamic and remove the lid. Cook until the onions are caramelized, stirring very occasionally, about 40 minutes. Deglaze the pan with the vermouth. Add the stock, salt, pepper, bay leaves and thyme. Bring to a boil then reduce the heat and simmer for 30 minutes. Remove the bay leaves and thyme. Bake the bread and cheese on a baking sheet for 5 minutes at 350 and transfer them to the top of the soup. Alternatively, divide the soup among oven safe bowls. 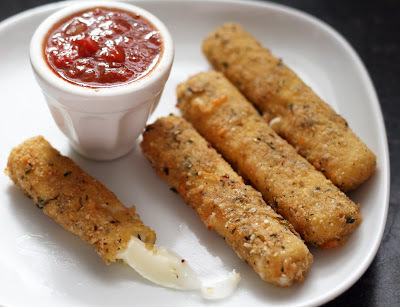 Top with a slice or two of bread and sprinkle with cheese. Bake for 10 minutes at 350. If you have broiler safe bowls and a roomy broiler, top with bread and cheese and broil until the cheese melts. Note: I wanted to speed up the dinner process so I caramelized the onions and deglazed the pan in the morning and then refrigerated them until I was ready to make dinner. You could do this the night before if desired. Follow the rest of the directions as written about. I don't see French onion soup on menus very often anymore (too '60s?) which is shame because it is one of the few soups that can pull off being elegant and rustic at the same time. Luckily, it is easy to make at home. It is slightly time consuming, there is nothing difficult about the recipe. Caramelizing onions is a hands off activity for the most part and you barely need to stir the soup as it cooks. There are a lot of variations in recipes for the soup: everything from using sweet onions (not needed, yellow onions a quite sweet once caramelized, no need to make candy) to including apple cider (ew!) and a lot of different cheeses. 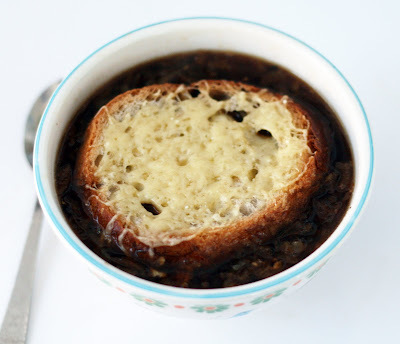 I created this recipe to make my own ultimate French onion soup, one that is very flavorful but not too rich. I dispense with the sugar many recipes call for and use balsamic vinegar to help along the caramelization process while adding to the depth of flavor. I am also fond of floating a slice of bread on the top of the soup rather than broiling the whole thing. Same flavor, maybe slightly less cheese and no need to buy broiler safe bowls. Preheat oven to 325. In a small bowl, whisk together the zest, ginger, sugar, salt, pepper and five spice powder. Rub the dry rub into the skin of the duck. Place the duck on a roasting rack on a roasting pan and roast for 2 hours or until cooked though*. Allow to cool slightly then shred the meat and set aside. Add the flour and boiling water to a boil. Whisk together. Flour a clean, flat surface. Knead the dough until smooth, 3-5 minutes. Cover in plastic wrap and let sit for 30-40 minutes. Roll the dough into a tube about 1 1/2 inches thick. Cut into 16 equal pieces. Use the palm of your hand to flatten each one slightly. Brush the top of half the rounds with sesame oil. Top with a second pancake. Roll them together until they are 5-6 inches wide. Stack, covered with a damped cloth until ready to heat. Heat a nonstick pan and cook each pair for about 2 minutes on each side. Separate them into individual pancakes. Wrap the stack in foil until ready to serve. If needed, steam in a bamboo steamer or microwave them for a few seconds to reheat. Meanwhile, rehydrate the mushrooms and lily buds in hot water. Cut off any hard bits on the lily buds and tie them in a knot. Thinly slice the mushrooms. Set aside. Whisk the omelet ingredients together. Cook the eggs in a flat layer in a nonstick skillet or work. Slice into strips. Set aside. Heat the oil in a wok. Add the vegetables, lily buds, mushrooms and broth. Stir fry for 2 minutes. Add the soy sauce, sesame oil and shaoxing. Stir fry for 1 minute then add the cornstarch mixture. Cook until the mixture boils. Add the egg and duck. Stir fry for 2 minutes. Serve in pancakes with hoisin sauce. *If you would like to reserve the duck fat for another recipe, drain it off the bottom of pan every 1/2 hour to 45 minutes and pour into a heat safe container. Duck fat is amazingly tasty to cook with. This is a bit of a time consuming recipe, I admit, but it is worth it. The pancakes are super simple to make (who knew?) and the duck is so flavorful that when you sit down to eat, you won't remember that it took the better part of an evening. If you are a planner, make the duck ahead of time and just toss it in with everything else when you actually want to eat. 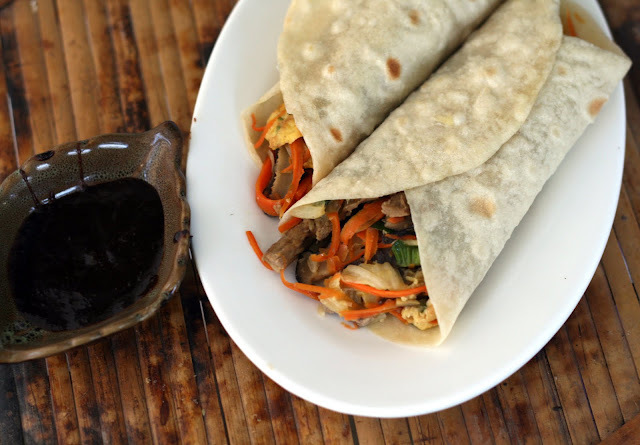 Normally moo shu is made with pork (or occasionally chicken) but we found a duck for a good price and thought it would make an excellent variation. We were right, the meat is succulent and adds a richness to the mixture that is similar to what you would get from pork but slightly more complex. Not to slight pork, you know how deep my love for pork runs, but it is a wonderful, delicious change. Some of the ingredients are a bit exotic but any Chinese (or even Korean in our experience) store will have them and since they are dried they keep for ages, possibly even years. I really would try to find them all, they add the perfect textures and flavors to the dish and are sorely missed if absent. Leftovers hold up surprisingly well. Just refrigerate the pancakes and filling (separately)in air tight containers and reheat them over low heat the next day. What a treat it is to have homemade moo shu pancakes for lunch! Place the chicken and marinade in a resealable bag. Marinate 30 minutes. Prep the dry noodles according to package instructions. Set aside. Whisk together the sauces. Set aside. Cook the egg in a single layer in a nonstick skillet. Break into strips. Set aside. Heat a small amount of oil in a wok. Stir fry the gai lan until fragrant until bright green. Remove to a bowl. Add the garlic and stir fry until fragrant. Add the chicken (discard the marinade)and stir fry until almost cooked through and slightly charred on both sides. Add the fresh or prepped dried noodles and half of the sauce. Stir fry 1 minute, the noodles should char slightly around the edges. Add the egg and gai lan. Stir fry and toss with remaining sauce. Serve immediately. 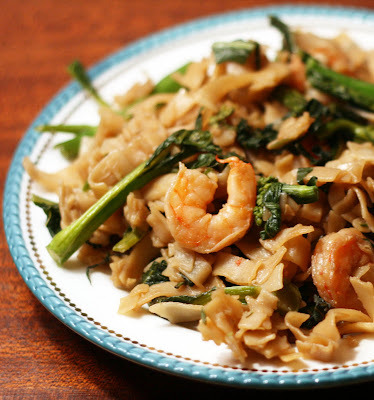 Pad see ew is a staple at many Thai restaurants. It has a balance of sweet-savory that is really appealing even if you are, like me, a spicy food lover. 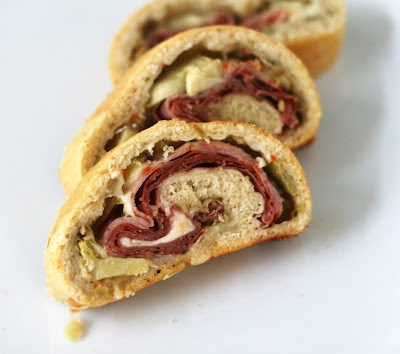 I had a lot of fun developing a recipe that mirrors what I've had at my favorite restuarant. Cooking each bit individually is key to this recipe's success. Marinating the chicken infuses it with flavor and helps the chicken stay juicy. Take care not to let too much of the actual marinade into the wok or the final dish will be too saucy. The bit of sugar in the marinade helps achieve the "wok char" on the noodles and chicken that adds a smoky flavor and complexity to the dish. It tasted fresher and better than what I've had out and I made it in less time than it takes to get to the restuarant and park. Note: The really wide fresh (or dried) rice noodles needed for this dish can be difficult to find. Substitute the widest noodles available.